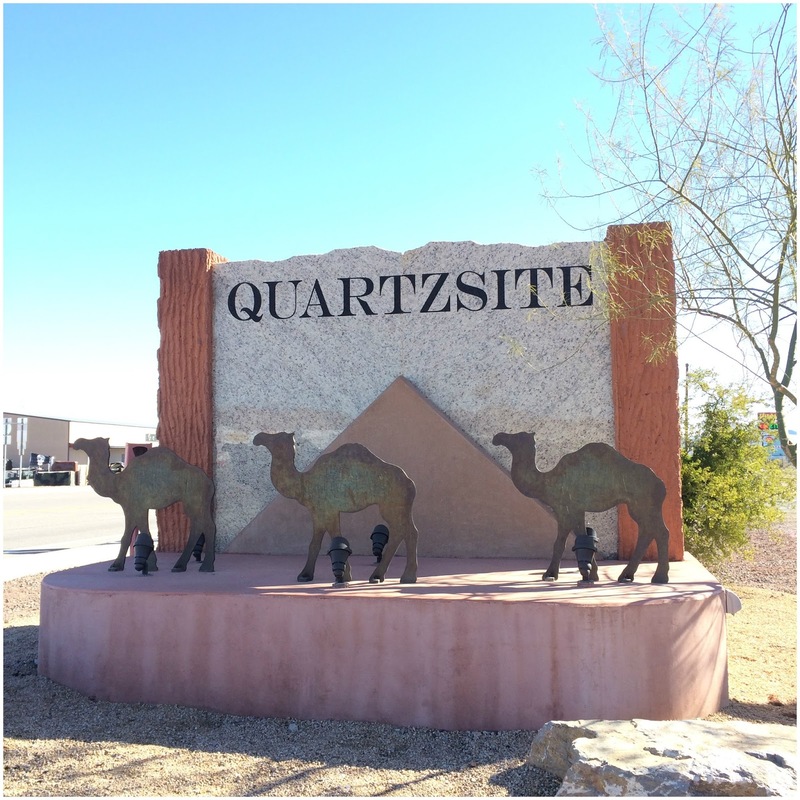 On February 1, 2016 we headed to Quartzsite for another quick two night stop. Originally we planned to stay only one night, but when checking weather in Phoenix, our next stop, we discovered that the temps were going to be in the low 30's on the morning of February 3rd. While in Phoenix we will be staying at Nancy's nephews house and storing the RV and were afraid of the pipes freezing. The drive to Quatzsite took us through a variety of landscapes. Started off with mostly sand, which by the way in some places you can see where they clear the road of sand like they do when there is snow. Then we came upon rolling hills of scrub and sagebrush. Then there were mountains to climb. 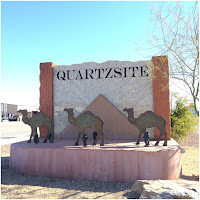 Quartzsite is a small RV town, there are RV parks one after the other down the main road. Where there are no RV parks there are flea markets and gem stores. We stayed at the 88 Shades RV Park. Nice campground with good sized lots. We were able to keep our car hooked up on the tow dolly in our space with room to spare. 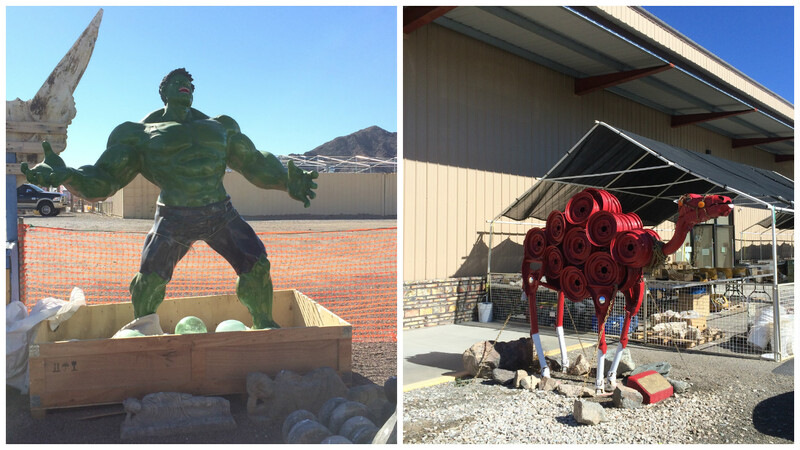 There is a pool and a spa on site, and lots of activities planned for guests and residents. There are a number of permanent residents, but all of the sites are kept up very well. 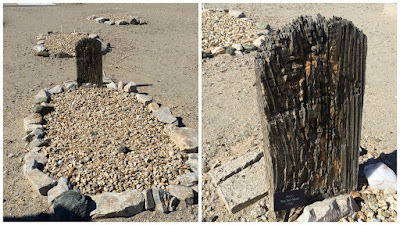 A dry river bed runs along one edge of the park and is the perfect place for dog walking, and there is also a fenced in pet area. Laundry room and bathrooms were very clean and there is a nice cactus garden. we also found a Roadside Oddity. Hi Jolly Cemetery is a few blocks off the main road and while there are some current grave sites most of them are from the late 1800's, with very weathered tombstones. The cemetery is named for Hi Jolly, who was born Philip Tedro around 1828 in Syria. He converted to Islam and made a pilgrimage to Mecca, and changed his first name to Hadji Ali, the American version of that became Hi Jolly. Later in life he changed his name back to Philip. In 1856 he became one of the first camel drivers hired by the U.S. Army to lead the camel drive experiment in the southwest. The camels were used while surveying roads across northern Arizona. He is considered to be one of the most colorful of the drivers because he remained in the desert southwest and became a prospector, scout and was a courier for what was called the Jackass Mail. He was a packer and hauled freight in the area also. In his day the town was called Tyson's Well. 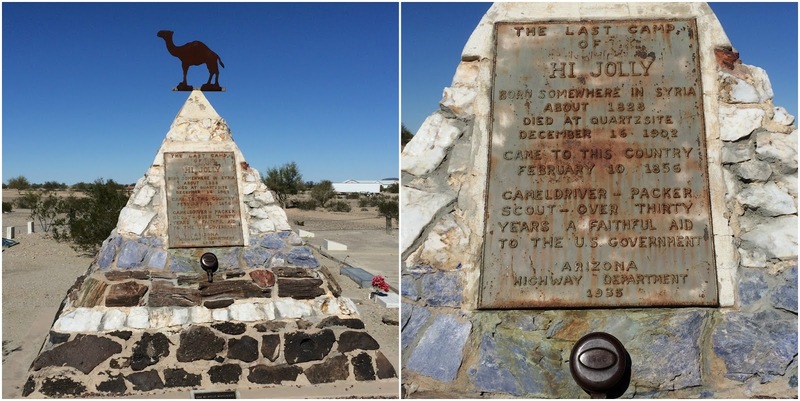 In 1934 the Arizona Department of Transportation erected the monument over his grave. There is a vault at the base of the memorial that holds the remains of Topsy, one of Hi Jolly's favorite camels. The metal camel at the top of the memorial symbolizes the legend of the Red Ghost. The legend started back in 1883, and tells of a large reddish-hued beast with a devilish-looking creature strapped on its back. After each sighting cloven hoof prints much larger than those of a horse, along with long strands of reddish hair were found. The devilish-looking creature was a ragged dressed skeleton. Next stop Phoenix and a mini family reunion. ~ Moving Day Checklist. Seasoned pilots still use a checklist before each flight so nothing gets forgotten, and it's a good practice to follow. It is important to make sure you have everything secured down, unhooked, shut off and picked up. After all most a year on the road we obviously have a pretty good system in place for take down, but it is easy to forgot something. We have heard horror stories of people not unplugging their electrical cords or unhooking the water hose. These can be costly mistakes. Worse thing is leaving your antenna up, we don't ever put ours up so not a worry for us. We have flagged other RV'ers down to let them know theirs was up. A written checklist to run through can save you lots of time and money. ~ visual reminders - some people will hang their RV key from the handle of the antenna latch inside the RV. They can't start the engine without it, so a great visual to put the antenna down. ~ after pulling out of the space, stop and get out and walk the site again to make sure you haven't left something behind - your jack platforms, a coffee cup on the picnic table, your wrench or other tools needed for take down, etc. Also a good time to make sure you haven't left trash behind.